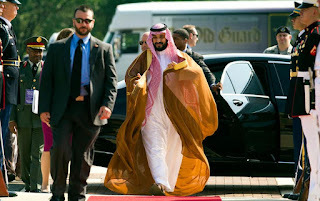 Saudi Arabia Defense Minister Mohammad bin Salman Al Saud arrives to attend the Global Coalition to Counter ISIL Meeting, hosted by Defense Secretary Ash Carter, at Andrews Air Force Base, Md., Wednesday, July 20, 2016. Defense and foreign ministers from more than 30 nations are gathering in Washington to plan the next steps in the fight against the Islamic State group and to determine what more they can do as the fights for key cities in Iraq and Syria move forward. WASHINGTON (AP) — Defense and foreign ministers from more than 30 nations gathered Wednesday to plan the next steps in the fight against the Islamic State group and to determine what more they can do as the fights for key cities in Iraq and Syria move forward. Defense Secretary Ash Carter met with his counterparts on Wednesday to discuss how they can accelerate the campaign and build on some of the momentum, particularly in Iraq. The meeting comes as Iraqi security forces, aided by the coalition, are preparing to encircle and eventually attempt to retake the key northern city of Mosul. The meeting of defense ministers at Joint Base Andrews just outside Washington, D.C., is the fourth time that Carter has convened an anti-Islamic State coalition meeting. Pentagon press secretary Peter Cook said Carter will talk about the military campaign and how it can be accelerated. Secretary of State John Kerry was hosting a separate conference at the State Department Wednesday to try to raise at least $2 billion from donor nations to help Iraq as it takes territory from the Islamic State group. "This is a cause that truly deserves a firm and generous commitment from everybody," Kerry said. The money will go to humanitarian aid for displaced people, demining, immediate help to recently liberated communities and the people returning to them as well as medium-to long-term reconstruction and development assistance. The U.N. estimates that there are currently 10 million Iraqis in need of assistance and that number is likely to exceed 13 million by year's end. He told reporters that the situation in Libya and a rise in the number of foreign fighters there will be one major focus of the meeting on Thursday. "Libya is incredibly complicated to say the least," he said, noting that until six months ago the country was without a functioning central government. "We have some momentum, the discussion will be how to build on this momentum." The gathering comes on the heels of the NATO summit in Warsaw earlier this month, when allies agreed to boost support for the anti-Islamic State mission. NATO agreed to start a training and capacity-building mission for Iraqi armed forces in Iraq, and the allies agreed in principle that alliance surveillance aircraft would be able to provide direct support to the U.S.-led coalition fighting IS in Syria and Iraq. The alliance will also begin flights by AWACS surveillance planes this fall and will set up an intelligence center in Tunisia, a major recruiting ground for IS. The U.S. has announced that it will send 560 additional troops to Iraq, to transform a newly retaken air base into a staging hub for the long-awaited battle to recapture Mosul from Islamic State militants. The new American forces should arrive in the coming days and weeks. Most of the engineers, logistics personnel, security and communications forces will concentrate on building up the Qayara air base, about 40 kilometers south of Mosul. The extremist group captured Mosul in the summer of 2014. It is the second largest city in Iraq and has been used as the group's main headquarters since. The coalition is also looking to reinforce the fight in Syria, where U.S.-backed forces are in a tough fight for the town of Manbij. Manbij lies on a key supply line from Turkey to the Islamic State's de facto capital of Raqqa. Ousting the militants from Raqqa is a key goal for the coalition.